Natuzzi Editions Artisan electric reclining chaise corner sofa. 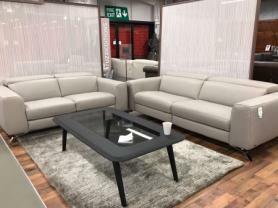 Upholstered in full Le Mans taupe craftsman leather with stylish chrome legs. Features 2 manually adjusted ratchet headrests. Left or right hand chaise available.